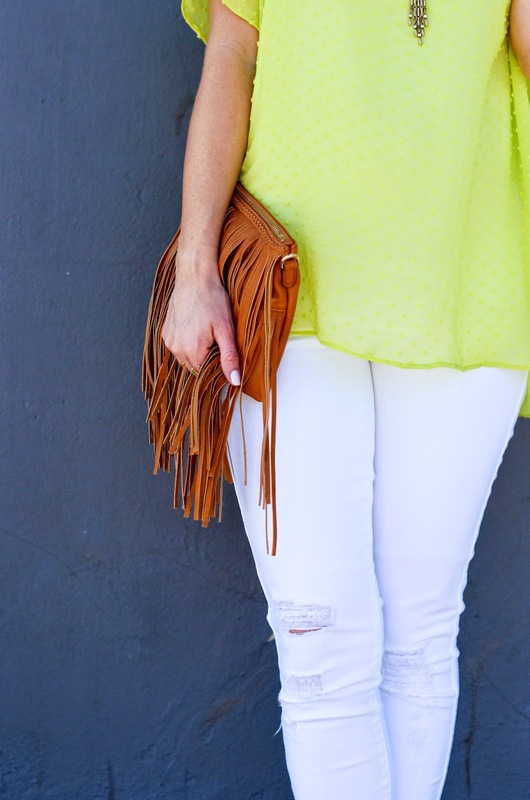 I'm declaring citron/chartreuse to be one of my favorite colors for spring. It is bright and fresh, and looks good with so many skin tones. I keep seeing the color pop up everywhere and I am instantly drawn to it. 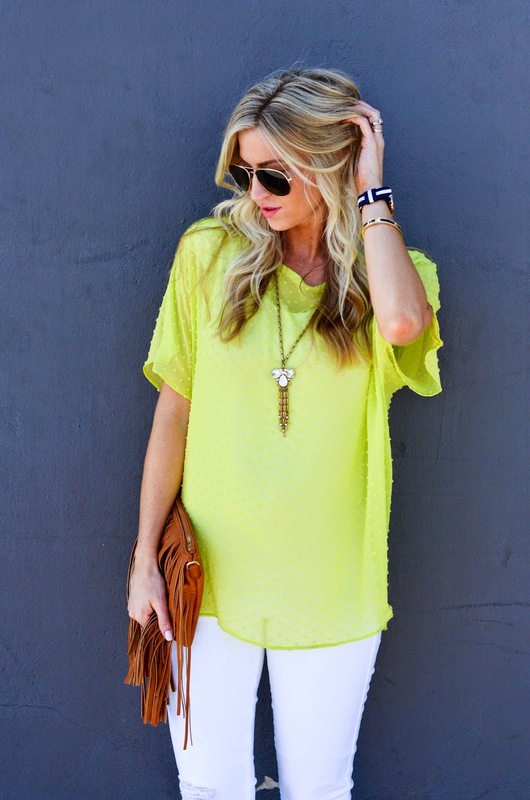 Here are a few of my favorite chartreuse pieces I've seen around. I can't get enough of it! 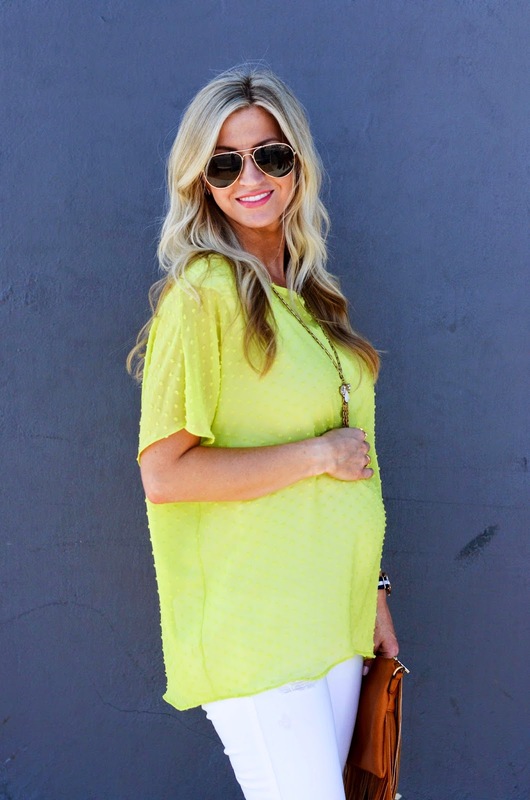 With this pregnancy I have been so in love with loose fitting, dolman sleeved tops. They are easy to wear and I love the look of them over a baby bump. Some of the tops I have tried on were too short, so I created my own pattern so that I could make the top as long as I want. 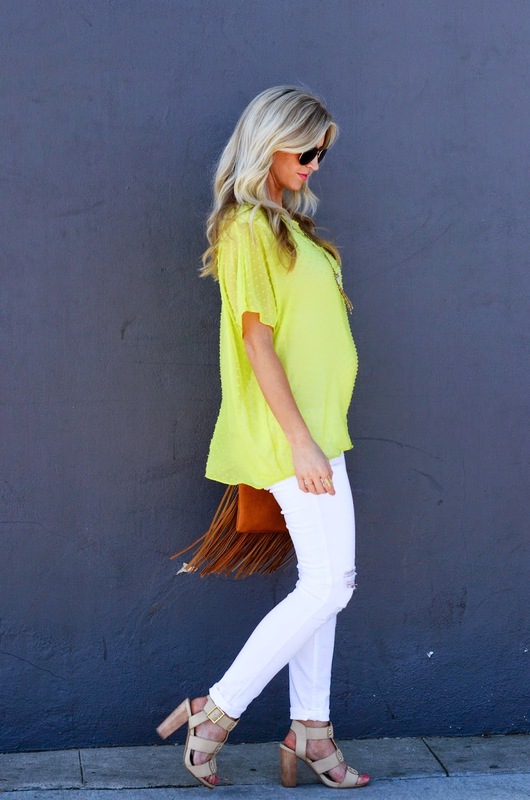 I need to add the extra length for this growing bump! Check out my full tutorial for this top after the jump below. It is really simple, I promise! No sleeves to put in, just a front, back, and neckline to cut. I recommend making a pattern for it first because you will want to make a handful of these! 1 1/2 yards of thin woven fabric with a good drape, like chiffon, silk, or a rayon blend. 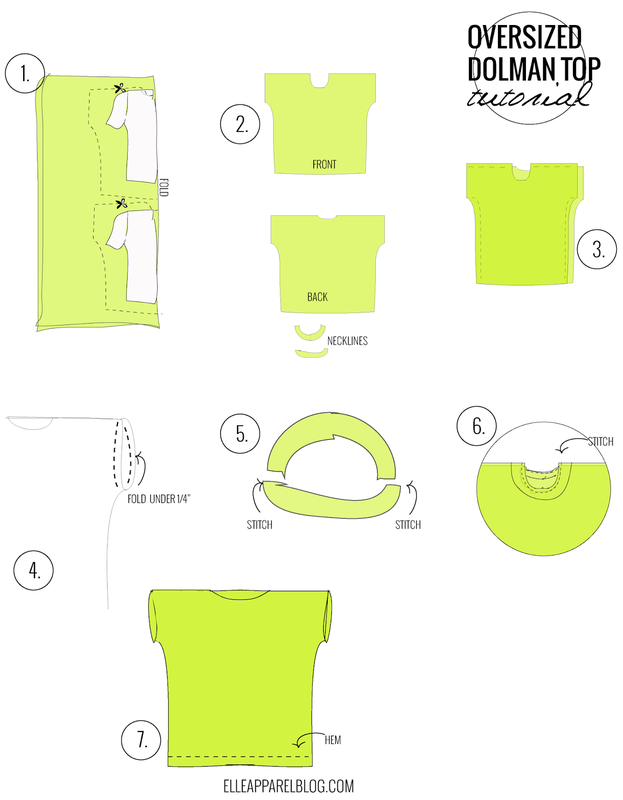 Using your fitted tee as a pattern, fold the tee in half length-wise and lay it on top of your folded fabric matching up the folds. Trace around your neckline, adding 1/2" for seam allowance. Then from the top edge of your neck, just measure straight out, about 13" (this was my measurement, you can shorten or lengthen however you'd like). From there draw a line straight down, making it about 2" longer than the length of your original tee sleeve (my sleeve measured 9" long). From there make a slight curve toward the armpit, then draw straight down. Draw this line about 4" away from your original tee. The idea is to make the tee loose and flowy. So don't stress about getting the measurements, just use your tee as a good way to eyeball your outline. Make your pattern as long as you'd like. Mine measured 27 1/2" from the top of the sleeve to the bottom of the hem. 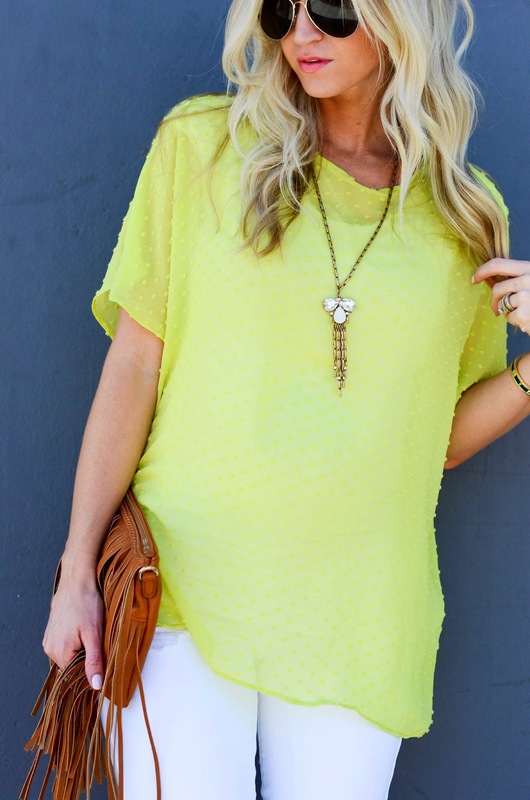 Repeat this step with the backside of your tee, making sure not to make your neckline quite as scooped. Now you should have a front piece, a back piece, and front and back neckline pieces. Finish the edges of your sleeves with a serge or zig zag stitch, and fold them under 1/2", pin, and stitch around the arm holes. With right sides of your neckline pieces together, stitch up the two short sides so that you have a loop for the neckline. Finish off the outside ring of the neckline with a serger or zig zag stitch. Pin your neckline all around the neck of your shirt on the right side. Stitch all the way around the circle with a 1/2" seam allowance. 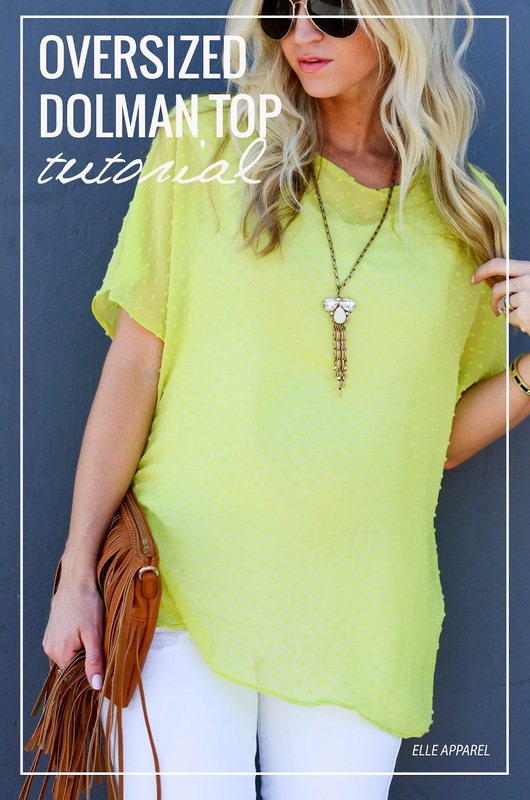 Finish off your raw edges with a serger or zig zag stitch, fold your neckline under and press. Now topstitch around your neckline 1/4" all around to secure your neckline in place. Finish off the bottom edges of your shirt, and fold under 1/2", press, and stitch all around for your hem.